This blog today is on Common Core. Let me start by staying that I am not an expert. Honestly, I’ve been working on this blog for weeks trying to get information and find facts, sources and some sort of logic behind this. I’ve done my best to site as many sources as I could find. I don’t want to start an argument with this blog, I simply want to share some of the information with you that I have found through different channels and hopefully open your eyes that the common core imitative is NOT simply a “set of standards”. I also don’t want to sound like Chicken Little here. 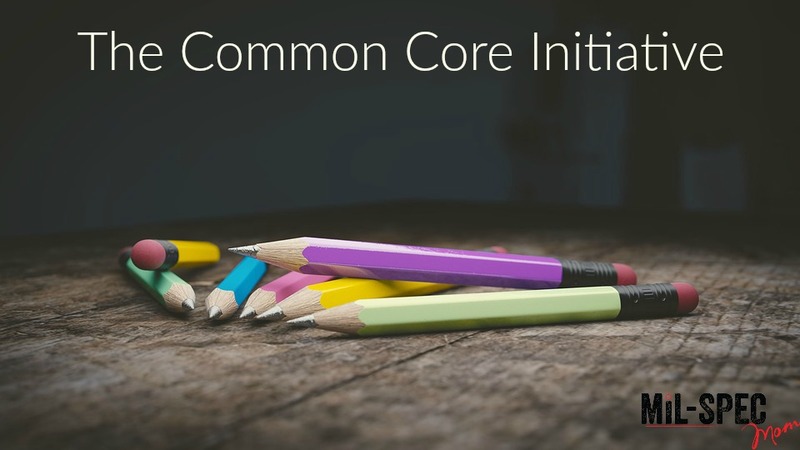 It would be very easy for me to say that the common core initiative has future plans to create drones of our children and make it easier for the federal government to take over complete control of our nation and squash any hope of freedom, liberty and equality. I could go further that this is the first step towards the one world government that Revelation talks about. But here is the thing, I don’t have to say it, many others already have. I want this blog to be more informative and let YOU make that decision for your family that you need to make about this stuff. Most think that it’s simply a set of standards and on some level it is. However common core is a federally mandated curriculum program. Most pro-common core literature states that it’s a high-quality standard that ensures uniformity among students around our nation. On the surface this concept looks great, but what it really is, is a federally led initiative to take the states control of education away. Furthermore the “standard” of the curriculum is abhorrent. There is a reason that the Common Core Initiative has been labeled the “dumbing down of America”. Common Core is a politician lead program through the National Governor Association. They lead the initiative through the NGA so it would appear to be state lead, but it is not. The Fed’s are still calling the shots. In any big initiative, company or organization if you follow the money you will find out what’s really going on. If you research more into the Gates Foundation you will see that he has given buckets of money to the common core initiative. My question is why is a computer software developer giving money to the federally mandated education program? My only answer to that question is to make money. What are people’s biggest driving force? MONEY! Gates wants to help build future consumers. You can get more information on this topic on the documentary “Building the Machine”. The Race To The Top program “[was] developed by private organizations with no transparent review and finalization process, and no public discussion of final draft. The March 2010 public comment draft went out for two weeks of comment, but the comments are not available to the public”. Again, if you look into the documentary “Building The Machine” it lays out the face that there were 7 people reviewing the Common Core initiative. Only two of the seven were educators, the rest were politicians. The two educators, being who and what they do, did not approve of the program. We will get into the why later. Because the two educators didn’t approve the program they were black balled. There was no documentation that the two educators ever existed or had anything to do with the vetting process at all. They were on no documentation period. The federal government wanted to give the impression that all the “vetters” were 100% OK with the initiative. With taking these two educators out, they were able to lie to the American people and show them what a great program they thought it was. However, let me remind you of the fact that the other 5 people who approved the Common Core Initiative were NOT educators; there were politicians who profited from this being filtered to our schools and into the minds of our children. So why is the Federal government giving money to a program that constitutionally should be state led? Why are the Fed’s sticking their noses into state lead programs and mandating that states do their educational processes certain ways? My honest opinion? For control! The government doesn’t like what it can’t control. It’s no secret that our federal government has over stepped its boundaries for years now. The federal government was instituted to be a back up to the states, to be an overseer. It was NOT created to be “big brother” and have complete control of the states. I don’t think I need to expound on the constitution. The constitution was created to give the federal government limits, not complete control of the nation. Part of the allure of the Race To The Top program was money. In 2008-2009 our country went to a small recession. The federal government got smart and put money behind the Race To The Top program. If a state signed on to do the Common Core Initiative, they got billions of dollars for education. At the end of a recession what school is going to say no to billions for dollars for education? What the schools did NOT have access too was the Common Core Curriculum. The state was forced to say “yes” or “no” to common core sight unseen. Naturally any school is going to towards the money and only later realized how horrendous of a program it is. Not only did the state have to implement the common core curriculum but they had to do all the testing that came along with it. With each district that received the funds from the government they were not allowed to stray further than 15% away from the original common core curriculum and still receive the funding. In the grand scheme of things 15% isn’t much at all! This restricts the teachers and their creativity with their lessons. This restricts the teacher’s ability to better convey the information to the students and how the students learn! Now I will say this about standardized testing. It IS necessary. It is crucial even to evaluate the progress of the students. I took the standardized bubble tests throughout my grade school years also. Those tests told me that I sucked at math. Those tests told my parents that I sucked at math and those tests told my school that I sucked at math. That’s it. No one else ever saw my test results. You know why? NO ONE NEEDED TOO! The thing about all the crazy testing is this; no one can tell you where the results go. The school doesn’t know who gets the results, but someone out there in cyber-land does. I don’t know about you, but I don’t want a random company (research Pearson for more info on that), organization or the government getting my child’s test results. That’s just weird. Along with Common Core comes all the testing. PARCC is just one of the tests that schools are forced to administer now. PARCC stands for “Partnership for Assessment of Readiness for College and Career”. The tests content is so incredibly age inappropriate. I don’t mean that the tests are asking gratuitous questions, but rather questions that any normal 3rd grader would know. Essentially things means that 3rd graders are given a 6th grade standardized computer test. Is that fair? Not at all. How can we test children over content that they haven’t learned and haven’t developed the brain functions to learn yet? This means that the teachers are having to teach to the tests and not the concepts that they should be learning at this age. Another aspect of the Race To The Top funding is that it’s tied to teacher evaluations. Schools only keep the money is teachers have a good evaluation. A good teacher evaluation is tied to their students text scores. So what does tying money to the teachers evaluations mean? Again, that teachers are teaching to the tests rather than the concepts that the children need to know. Basically the teachers are teaching a brain dump, as soon as the children are done with the test; their brain dumps all that random information. Because in reality, it’s all it is anyway, just random information with no context. Thirdly, this creates a high atmosphere of schools and teachers cheating in any way possible to keep the funding for their school. What school doesn’t need more funds? As I stated above the teachers only have a 15% margin to deviate from the original common core initiative the children’s test scores are dropping dramatically. Thus, the teachers are losing their jobs over low test scores because the content and the tests are age inappropriate. I don’t agree what the government is doing with common core, but I have to admit, it’s a fantastic business plan. Take a desperate broken system and dangle money in their face, without telling them what price it actually comes with. Simply genius. With the PARCC and other testing that goes along with Common Core comes the data mining. Schools who have implemented PARCC and the other testing are made to monitor students and gather data points on each student per day. As many as 500 data points can be accumulated on ONE student during normal school hours. Who needs to know 500 different points of data about my child at school? What are they going to do with it? More importantly, who gets that information? Again, no one knows. Random data compilation companies at best, but again, what do they need with my son’s information and why is it important to anyone else other than the parents and the teachers? In blue states in the northeast they’re contemplating making students wear bracelet monitors to be able to gather more data points on the students. On our local news this morning there was a segment and it stated that the Gates Foundation stated that pencil and paper doesn’t have any room in the class room. Excuse me?! Do our children not need to know how to write any more? Pencil and paper was said to be archaic. Wants to know why it’s archaic? First, you can’t monitor students via pencil and paper. Second, the Gates Foundation doesn’t get any money if all the students don’t have an ipad to do their school work on. It would seem to me that the Gates Foundation is just interested in making future consumers rather than making sure the students have a well rounded education that includes how to write their name. Will Estrada, director of federal relations for the Home School Legal Defense Association, said the assessments tied to Common Core collect more than 400 points of data on every child. The idea behind opting out is to “starve the beast,” a reference to the corporations and nonprofits that feed on the $8 billion student assessment industry. They analyze the test data, come up with recommendations on how to “remediate” the students’ weaknesses, then sell that information back to the school districts at a profit. This photo tells me everything that’s wrong with common core and where the federal government is leading our children. This photo is of a 1st grade student’s homework. To answer the question in the photo one would have to get into extended math applications, which are NOT taught in the second grade in this form. You know why? IT DOESN’T MAKE SENSE TO THEM YET! They’ve not built their foundation for understanding math before jumping into this craziness. You don’t cover addition one day, then algebra the next day. It just doesn’t work that way. Our children’s minds don’t work that way! When this type of crazy is introduced to our children us as parents are helpless to help them. The government is literally alienating parents from their children. The children are being swayed to think that ONLY the teachers can assist them in understanding their homework. This takes parents out of the picture almost entirely. I’m sorry but I have an issue with this. I birthed that little munchkin and I will absolutely have a say in his education, well being and everything else until he turns 18 and is able to have more of an opinion of his own. Does this scream SOCIALISM to anyone but me?? Seriously, the teachers (and subsequent government) are there to help my child where I cannot. Yeah, I don’t think so. My son(s) belong to my husband and I. They don’t belong to my neighbor, they don’t belong to my church, they don’t belong to my town, community, county, state or country. They belong to us. The constitution gives us the right to be a parents. I think this amendment says it all, don’t you? Below is a bunch of resources that I used to compile this information. Being honest I am very against Federally Lead education so I apologize for my slant there. However I feel that the information speaks for itself! I couldn’t have compiled all this info without the help of my two friends Lanie and Erin! Thank you girls! All I ask of you, the reader, is that you take the time to research this also. Especially if you are pro-common core or a teacher or someone who just doesn’t know anything about it like I didn’t! It’s disturbing. It’s scary and the federal government needs to stay away from our children. If I remember correctly that’s the reason that each state has its own constitution and governors! Each State was originally created to be its own separate entity of sorts and the federal government was created to handle issues that could not be handled at the states level. The federal government was NOT created to be a kingship over our states like it’s trying to be. As with all my controversial blogs I ask that you be respectful to other readers and me. This is a hot topic with many folks for many different reasons. I also ask that you check out these links and do your own research and formulate your own opinion. It’s not just a set of standards.